In May, A FEMA 'National Level Exercise' Simulated A Hurricane Which Devastated East Coast, Took Down The Grid And Severely Damaged Nuclear Power Plant - Might Reality Soon Mimic Fiction? In this September 11th story over at WTOP in Washington DC, they report that just months ago, disaster planners for FEMA along with the Argonne National Laboratory conducted a simulation of a Category 4 hurricane striking along the middle of the East coast, with fictional 'Hurricane Cora' barreling into southern Virginia and up the Chesapeake Bay, actually striking Washington DC. Reporting that the result was catastrophic damage as Cora devastated the East coast, knocking out power to gas stations all across the mid-Atlantic, taking down much of the electrical grid, sending debris into major shipping channels and damaging a nuclear power plant while creating Hurricane Katrina-like flooding across huge areas, Joshua Behr of Virginia's Old Dominion University reported "What they were trying to do was create a worst-case scenario, but it's a very realistic scenario." Behr, a research professor involved in disaster modeling and simulations, also claimed "what I fear is that saturation, combined with a storm that kind of stalls out", exactly what we're now seeing with Hurricane Florence as the monster weakens and bogs down, prepared to deliver what some have called 'biblical rains' and flooding to North Carolina and wherever else it goes. And with some areas along the North Carolina coast now forecast to receive at least 20" of rain as seen in the image above as Florence stalls and dumps potentially record rainfall in that region along with what is expected to be a tremendous storm surge, we take at what could be a very important look back at this 2011 story over at WECT in North Carolina. As they reported, the Brunswick Nuclear Power plant, one of the oldest in the country, had previously been flagged for a possible flooding issue, with the US Nuclear Regulatory Commission stating these absolutely crucial words: "The violation involved the failure to identify and correct issues in the fuel oil tank rooms that made them more susceptible to flooding during a hurricane. The emergency diesel generators are used to power cooling systems for the reactors should the plant lose power off site." And with Brunswick Nuclear Power plant almost directly in the center of the 'pink bullseye' we see above, and absolutely in the 'line of fire' of Hurricane Florence, and forecast to get 20" of rain or more and a massive storm surge, the fact that Brunswick is only about 2 miles away from the ocean and sits at 20' above sea level is absolutely a concern, especially considering they've already been flagged at least once for violations that involve flooding and the ability of the plant to keep it's cooling system active should they lose power from the grid. 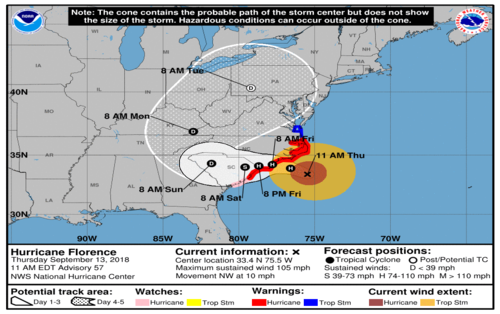 With it just so happening that mere months after FEMA's Cora simulation, Florence is bearing down upon much of the East coast with that storm expected to hit the same general area as Cora was simulated to strike though several hundred miles further to the south, should the flooding issue at Brunswick not have been remedied properly over the past several years and Florence deliver the kind of knockout blow many are expecting, a grid down scenario in that case could in a worst case scenario result in a nuclear attack upon America should Brunswick's cooling system be shut down and the nuclear plant be breached. And with the latest Florence track from the National Hurricane Center showing Florence continuing to move southwest before turning to the north and northeast, it's interesting that almost all of the East coast's population centers would then be in the path of the hurricane as it churns northward, potentially delivering deadly radiation all along the eastern seaboard should that worst case scenario happen and indeed, a nuke plant be damaged, though we hope that experts are correct when they say such a thing is a 'longshot'. Though 10 trillion gallons of rain water being dumped upon already soggy North Carolina, with some areas now forecast to be hit by over 40" of rain, over potentially a several day period, are far from 'normal' conditions. With Hurricane Florence also helping to prove to us that when SHTF, people no longer care about manners or being civil or even law-abiding as seen in this story over at the Daily Mail which reports chaos has erupted in stores in the region as the unprepared masses attempt to get stocked up, we'll close this story with a look at preparing for a nuclear disaster here in America. While something that we pray never comes, with between 10 and 15 nuclear plants in Florence's path depending upon the exact route towards the North pole that it takes, all it takes is for one nuclear plant to be damaged or melt down for Florence to instantly turn into a 'Fukushima-style' event in America. An excellent book on surviving a nuclear event from Cresson H. Kearney titled "Nuclear War Survival Skills" can be found at this Amazon link but for those who may be on the East coast and unable to rapidly obtain the book, we have embedded it in its entirety at the bottom of this ANP story. His book will save lives. And while Florence bearing down on Brunswick nuclear plant is only a day away, hardly giving us enough time to build a real fall out shelter, this story over at Realtor.com reports the best place to go in such an unlikely event is one's basement if one has one, and to the section of the basement that has the most feet of earth in between it and the above ground air outside. At least 3' of solid, packed earth provides the best protection. "The more material you can place between yourself and the rays, the better protected you will be." 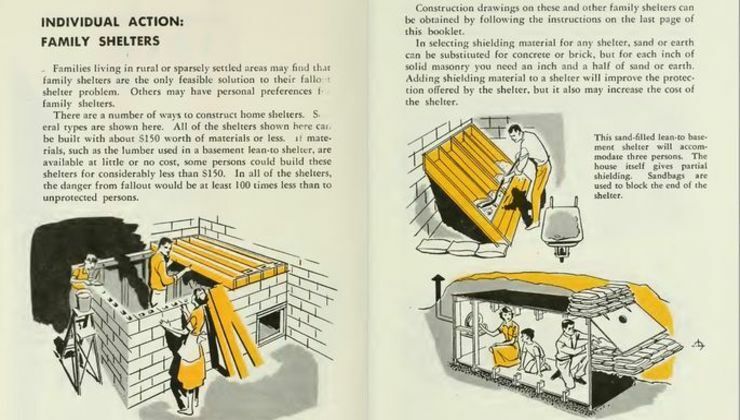 Also reporting that lead and concrete are also listed among the best options to block the gamma rays of a nuclear blast, the Realtor story then offers some very firm advice that we can also find in the book embedded below. "Sandbags, bricks, containers filled with water, or any heavy materials that you can find can be used to protect against a nuclear blast," Richardson notes. Just place these items against your walls—particularly the windows where radiation can still sneak through, or on the floors above wherever you are. Mattresses can be leaned up against windows, as well as stacked books, furniture, bags of clothes, and anything else with some heft. From there, it's time to stock up! The greatest risk of fallout occurs during the first two to three weeks following a nuclear blast, Richardson says, so if you're intent on hiding out in a shelter for that time, get enough food and water to last. It might not be comfy, but we're talking about survival here. And while Florence taking down a nuclear power plant and sending radiation across much of Eastern America may be a long shot that never happens, the small possibility of it occuring tells us that we serve our families and God best by preparing for it, for should it never happen, we'll still be way ahead of most should suddenly and without warning, nuclear war break out upon US soil. In the first video below we hear all about the recent FEMA simulation while the 2nd video below takes a look do-it-yourself nuclear fall-out shelters. In the final video below, Dahboo tells us about a bizarre wave anomaly coming from Antarctica that seems to have somehow interacted with Hurricane Florence. Is it being injected with energy, perhaps even weaponized? Stay tuned, America.